hi norvin, i’m sure there are some minor differences even among the original shure mics. And the color of the wires could just be one of them. I would say that as long as your mic..
You could be pretty sure that yours is most likely an original. 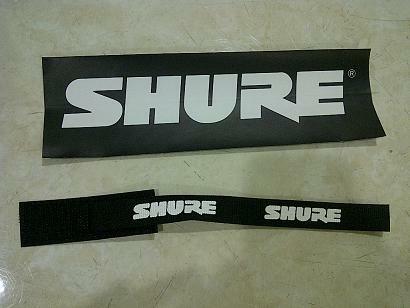 I just sent Shure CS detailed pics of 3 shure SM series mics I bought second handed. They were unable to determine their authenticity but said they could if I send them in. Apparently the counterfeiters are now that good. 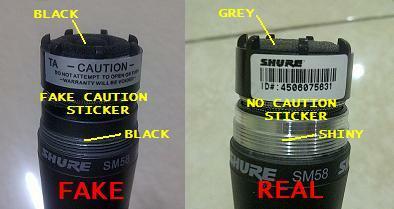 At this point, I wouldl not buy a gently used 57 or 58, sm or beta, any more without the proper authentication by Shure. is my mic a fake? Hi I’m not too sure about the wireless version. If the caution sticker looks exactly like the one in the first pic, I might be more suspect because this sticker seems to only appear on fake sm58s. I wanted to thank you for this information. I recently purchased an SM58 from eBay, and sure enough, it showed some telltale signs of being counterfeit. I then purchased a new one from a trusted seller and the differences are made even more clear. At the same time it seems some of the telltale signs have been addressed by the counterfeiters so i wanted to give you an update on what I’ve seen. Bottom line, i expect this mic to last me probably the rest of my life, but if it did need replacing, I’d definitely buy it from a reputable dealer rather than second-hand from anywhere else – not worth the risk! Hey, thank you so much. My microphone is going to arrive in the next few days and I’m worried because it was rather cheap. Let’s see how it goes.